As a self-diagnosed recovering perfectionist, I've discovered a fantastic new life motto: good enough. 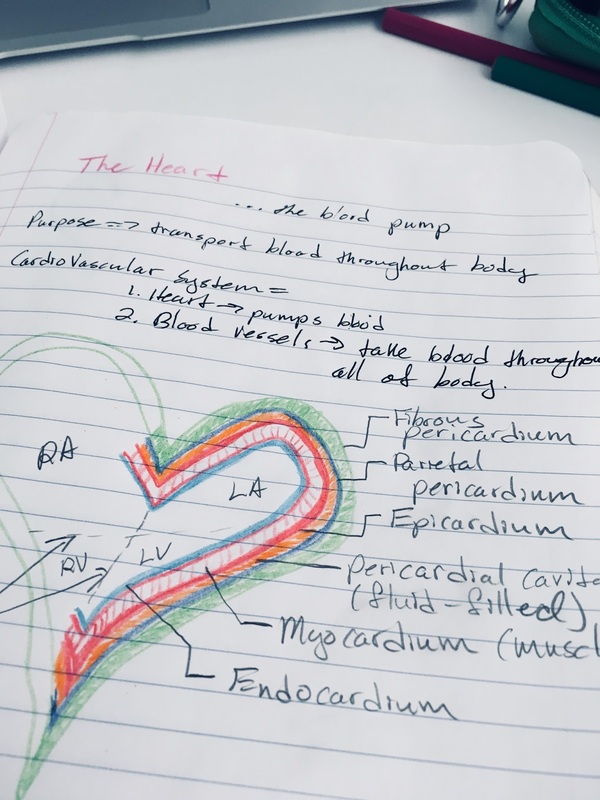 I recently decided to 'go back' to school by taking one course in anatomy at the local community college. After completing the necessary registration steps and procuring a student ID, I found myself in the book store reminiscing about old college days, exorbitant book costs, and ridiculously long lines. These days we have a thing called the internet where one might purchase any book, any or all additions, and have it delivered to one's door in two days. When I was last in school, the internet was for messaging your roommate across the room because it was so novel. Textbooks are still absurdly expensive, but as a new student in my late 30s, school is a novel experience. Going back to school is one of those rare opportunities that one has to do it all over again, but differently this time. And even though I found myself with the same old stomach full of winged caterpillars on the first day, it does feel different. Mostly I just don't care nearly as much this time around. Teachers do not reflect who I am and test scores do not determine my self worth. I laugh in the face of extra credit. Ok, maybe my ears still prick up at the mention of bonus points--let's not get crazy, I said I'm a recovering perfectionist here. But I kinda feel like I'm 'playing' school, like it's a big game or an experiment--how well can I do with less effort? And I'm having fun--a word never associated with academic pursuit before in my life. I woke up this morning thinking about my new approach to school, that there's a definite line between agonizing over perfection and stopping at good enough. This was not a part of my vocabulary in early school days. 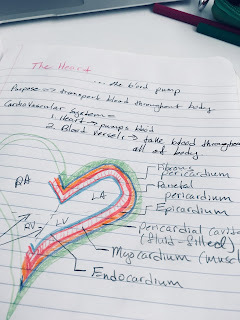 As silly as it may sound, I only knew how to strive without end, to study obsessively until you're certain you will know the answer to every question, to read a paper over and over again until your vision blurs--practices that seem verging on psychosis. At least, it's no way to live. 'Good enough' means putting in what is commensurate with what you are getting out. I'm finding I retain more learned information when I stop to consider it's actual relevance to me and my life, how it may benefit me or those in my circles. And that goes for everything in day to day life, work or play. As a reformed 'exceptional' student, it's astounding that it's taken me this long. I got good grades most of my life, but I studied for the test, I wrote what the teacher wanted to read. I was scholastically successful, but not life-accomplished. It's just not worth measuring up anymore to anyone else's expectations. I'm the only one who will account for my life and how I spend my time. Good enough is whatever counts and not a second more. That's what I (now) call perfection. When one of her unicorns loses a leg, 6-year-old Arwen remains nonplused. "Oh well," she says, "you can still do things without a leg." Several years ago, Arwen attended an outdoor aerial gig in which I performed. Her mom tells me that when Arwen saw me on the fabric, she was hooked. Every time I see her mom, she reminds me: "Arwen talks about you all the time...she thinks you are so cool." Last week, at the circus arts studio that her mom runs, Arwen reminded me herself when she walked over to me and said, "I like your little arm. I think it's cool." "Thank you!" I said giddily, "I think it's cool too." In a nutshell, this is what I do. Or, it's what I want to do: to let little girls (and boys) know that having one arm...or leg or ear or toe is OK, and more than OK...it's cool. But of all the emails I compose, meetings I attend, formal teaching I do, I really believe this is the most important work--the work of being fully who I am, being 'cool' in my body. It's not the sort of career one generally goes into. Not a lot of informational trifolds in the career counselors office on being one-armed. Not much money in it, I guess. But when a small person like Arwen, with so much love and life ahead, reminds me what I'm doing here, it feels right. It's simple, sometimes aggravatingly so, but I can't think of anything more rewarding I'd rather be, or do. For the third time in two weeks, I've been asked if I have difficulty with balance. This time it was in relation to my sometimes involvement in gymnastic horseback riding, in which I've been known to stand on a moving horse. The answer is, yes, of course I have difficulty with balance. Anybody trying to stand atop a trotting horse or climb on fabric hanging from the ceiling or just take a beginning ballet class is going to find themselves challenged by gravity. But I am not being asked this question because I partake in certain disciplines that require balance, among which is also cycling with a dog attached to one side of my bike. People are asking because I've got one arm and they are curious if my asymmetry is an issue. And the answer to that is no, not really. I'm no PhD, but I've had a lifetime of balance practice. And if anything is true, I've been balancing as long as I can remember. For example, you may easily find me balancing a tray of food or a jug of milk (or a baby) on my raised thigh whilst opening a door. "I'm going to write about balance," I told my new massage therapist. I was spurred on by what seems to be widespread ignorance of physics and physique. "Oh, you mean actual balance," he said, "not like internal or spiritual balance." Physical balance is way easier. When a medical professional asked me this week about my potential imbalance, she was not talking mental. I sheepishly explained how each person must have their own midline based on individual physique, a sense of balance that develops over time. She looked at me, nodding, "Yeah, I guess you're right." But even if you cut someone's arm off, they aren't going to suddenly fall over. Not in my experience, anyway. But I suppose the pen is also mightier than the push. If your summer is going anything like mine, you are finding yourself more and more active. 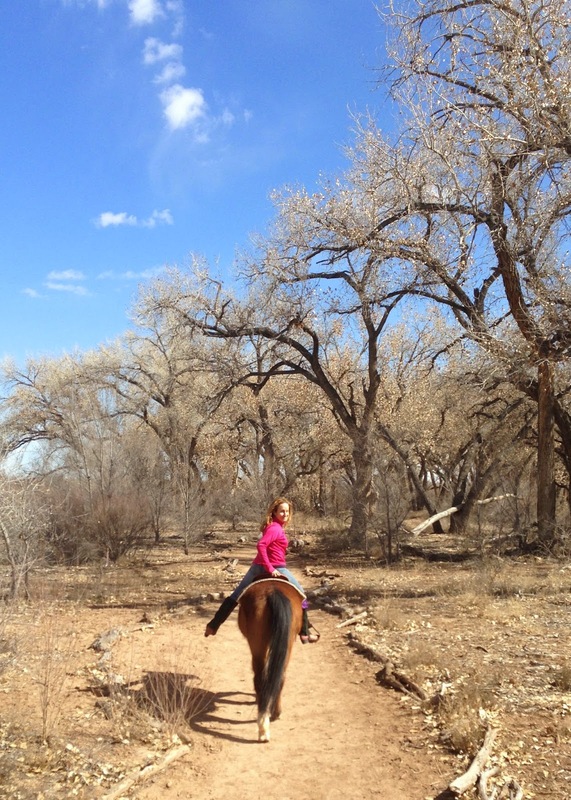 Coffee dates, horseback riding, teaching, fundraising--all very enjoyable, splendid things to do, but at the end of nearly every day I find myself sun-weary and muscle sore (including the brain muscle). When I was a kid, I was terminally afraid I was missing out. If it was at all exciting, I wanted to be a part of it. This pervasive anxiety over not doing enough or not being enough or not being where I needed to do something continued into adulthood. Then I got sick, so sick all I could do was lounge around my parents' house. I found myself in the middle of the very nightmare that stalked me. But I learned something critical during my convalescence: even when I was doing nothing, I was still doing something. I was still breathing. I was still seeing and feeling. I was resting. This shift in my thinking about the intentionality of rest was revolutionary. I learned to value the down time. I was no longer missing out or wasting hours of my life--I was existing at a slower pace. Days like these, as I find myself busy (now practically a curse word in my vocabulary) again, I long for that blessed rest. So I'm trying to carve out oases of creative relaxation into my routine, to allow myself the freedom to just take the afternoon off, drive to the mountains and watch a hummingbird buzz back and forth from perch to perch. I can't think of a better use of my time. Not long ago a good friend sent me a video of a double arm amputee successfully changing a flat tire on his bicycle. This week I tried to put a tire just filled with air back on my bicycle and failed. Thankfully no one was taping it, so you won't see it on YouTube anytime soon. Granted bicycle maintenance is not something I've put a lot of time into, but with my dog looking forlornly up at me after several days of pathetic walks, I trotted down to the basement with great expectation. I trudged back up with my unwieldy and uni-tired bike. Already exhausted, I assessed the situation before me. Thankfully, I had saved the hardware I'd removed with the second tire, careful to remember the order in which it needed to go back on. This only proved so helpful, however, as I attempted reassembly. I soon discovered that even if I could get the tire nearly into position, it was still impossible to open the breaks wide enough to fit around the tire. After tinkering with oily parts to no avail, I pondered my predicament for several moments and made a command decision. I would take the bike, tire, and other necessary pieces back to the bike shop where I'd had my tire pumped up and ask them to put the tire on. So I carried the bike, which seemed to have grown heavier somehow, down the alley to my car parked on the street. But the real challenge turned out to be getting the bike into the backseat of my sedan. Just when I thought I had it most of the way in, the front end would swivel and catch on the door frame. I cursed the handlebars. The break lever hit me on the jaw. I went to the other side of the car and attempted to pull it through. Then back over, nudging and pleading, seriously questioning life decisions that had led to this moment, not having a boyfriend being one of them. Finally, the bike settled in just far enough for the door to close. Too exhausted and sweaty to drive anywhere by this time, I walked grumpily back to the apartment, seriously considering the possibility that bicycles are secretly trying to ruin our lives. That's when I saw my neighbor Dave's wife walk out of the house next door and remembered that Dave is a sometimes serious mountain biker and probably not only could put my tire back on, but probably could have filled it with air in the first place. I wisely decided to eat lunch and walk the dog before taking the bike back out of the car. Yesterday, Dave stopped over and put the tire back on my bike in about two minutes. He also encouraged me to come to him in future before I decide to lose my marbles trucking it to the closest repair shop (well, he might have left out the part about my marbles). OK, man who changes his tires without arms, you got me. I'm just glad I know how to ask for help. 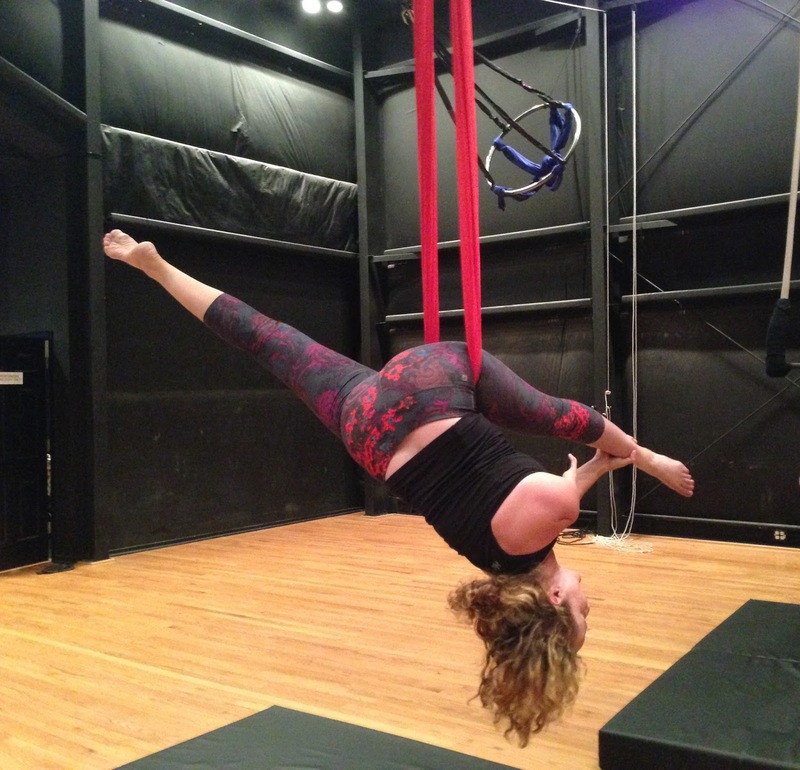 I wasn't given any physical therapy after I got my cast off in January, so I've instituted my own rehab routine, mostly consisting of aerial dance and horseback riding. In five weeks of wearing the cast, my range of motion decreased significantly and my grip was pathetic. I tried to lift myself up onto the lira (hoop), something I'd done easily in November, but was unable to stand the weight of my whole body. My finger felt like it might snap. So, I slowed down a bit. I've been doing finger stretches, squeezing exercise balls, and completely letting go of spooked horses that take off suddenly across the arena. I don't think rehab is something anyone enjoys much. A friend who took a nasty fall of her bicycle resulting in a broken femur last year is still waiting for her normal energy level to return; an aerial dance friend just told me she's been grounded for a month because of bruised ribs. While I was still in the cast, I went to see the movie Unbroken, which tells the survival story of US Olympian and WWII bombardier Louis Zamparini, whose plane was shot down in the ocean, followed by his imprisonment in Japanese prisoner of war camps. The movie was good, but at the end I was surprised to learn that it is based on a best-selling book by Laura Hillenbrand. Many may not know that Hillenbrand, who also wrote Seabiscuit, suffers from debilitating chronic fatigue and dizziness, and rarely leaves her home. As an athletic college student, she became ill very suddenly, dropped out and became dependent on care from her boyfriend. She wrote Seabiscuit and Unbroken--both tales of astounding physical achievement against the odds--after she got sick. I remember reading what is, to my knowledge, the only article she's written about her illness. She became so dizzy while writing Seabiscuit, she would sometimes hold her head up with one hand so that she could continue typing with the other. All of this came back to me as the movie credits rolled. I can't even manage to post to my blog regularly, I lamented. And this woman writes best-sellers from her bed. Have you ever wished you were housebound so that you might accomplish more? I had to ask: Would Hillenbrand have ever written a word if she had never gotten sick to the point of not being able to do much else? The value of life is often equated with productivity, but certainly not being bed-ridden. It's easy to feel like rehab is working to get back to a place where you once were. But what if it it more like re-shaping into something completely new? I went to see Cirque du Soleil recently for the first time. I was enchanted by the aerialists to which I aspire, but was most intrigued by one dancer who danced on crutches the entire show. I found myself wondering if he actually had a physical impairment that required the crutches or if it was just part of the show. His moves were so smooth, his transitions so seamless, he seemed to almost fly around the stage. But a hunch sent me to Google the next day. His name is Dergin Tokmak. From Germany, Tokmak contracted polio when he was a baby, but dreamed of becoming a dancer--influenced most heavily by breakdancing. When he learned Cirque du Soleil was actually looking for a dancer on crutches for the 'limping angel' in Varekai, he decided to audition. Now he's touring the world. I guess it's tempting to be impressed by how much someone with a physical disability has accomplished in the dance world, but I wonder how many show-goers don't even know Tokmak is handicapped. Rather than dancing in spite of his handicap, his dance seems inspired by it. 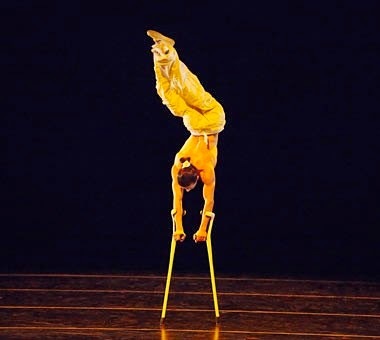 His uniquely strategic, flowing movement is made possible by the crutches which, like wings, carry him just above the stage. The angel's limp has become a dance.